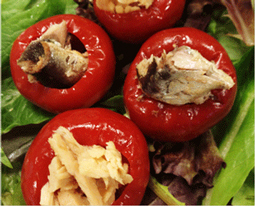 Peppadew Pepper Sardines and Tuna - A recipe from Savor California, the online showcase for extraordinary gourmet foods and beverages from California. Drain peppers, arrange on a serving platter atop a bed of greens. Remove sardines from can, cut each in half vertically and then each fillet into three pieces. Empty tuna into a small bowl, flake with a fork into large pieces. Stuff each pepper with either sardine sections or tuna.